This below worksheet help you to understand how to perform Binary to Grey code and Grey to Binary code conversion. The grey code is a type of distance code also known as cyclic codes. In unit distance code the bit patterns for two consecutive numbers will differ in one bit position. 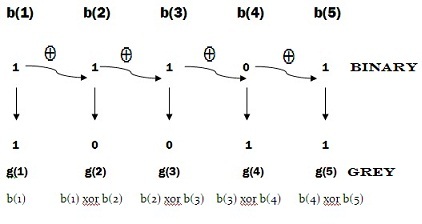 To find next bit perform Ex-OR (Exclusive OR) between the Current binary bit and previous bit. The next number can be obtain by taking Exclusive OR operation between the previous binary bit, and the current gray code bit and write down the value. 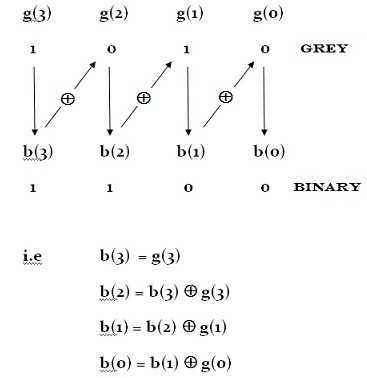 Look at the below example for Converting Binary to Gray Code. When you try this calculation on your own, use this binary - grey code converter to verify your answers.